I knew I wanted to roast the pretty little fingerling potatoes that we picked up at Trader Joe’s last week, but it wasn’t until I was digging through the produce drawer and spied the leftover Giant of Italy parsley from our CSA share that I started to formulate what flavors I wanted to combine with them. 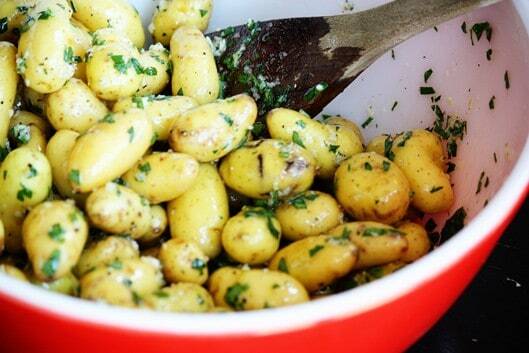 Toss in a little garlic, olive oil and fresh lemon juice, salt and pepper to taste and pop them in the oven. End result? A super easy and delicious side dish that we paired with some grilled chicken and perfectly simple fresh buttered peas. This really looks like some wonderful Fingerling Potatoes, and I’ll have to try them out. Some recipes I’ve used with Fingerling Potatoes were from Southwind Farms’ website http://www.southwindpotatoes.com/ they truly are tasty! 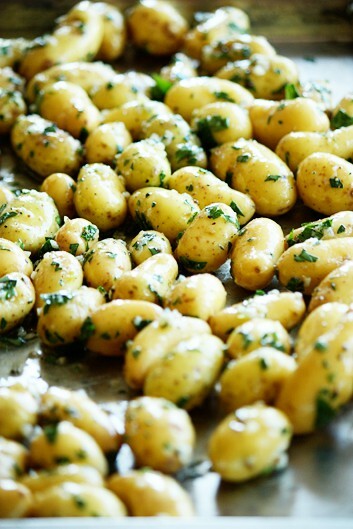 So happy I came across this recipe – I had 1lb of fingerling from Trader Joe’s and a whole bunch of parsley to use up as well. These were SO SO SO good. I added kosher salt as well. So happy to hear that, Angela! I typically use kosher salt as well when I cook. I tried some of the pink salt at a truck stop restaurant (on hash brown potatoes fried without oil) – I loved it! Wow! Those look better than “good.” I just got some Himalayan pink salt and organic peppercorns from Sustainable Sourcing https://secure.sustainablesourcing.com and I’ll have to try them out in this recipe. Thanks for sharing a scrumptious recipe!!! I’ve never tried Himalayan pink salt, but it looks really pretty. I will have to order some!